The past weekend was one of the most fun I have had in years. Seriously. You know, after having kids, when you go away for the weekend, you really just want to sleep. Well that did not happen because I was at a Bachelorette party. 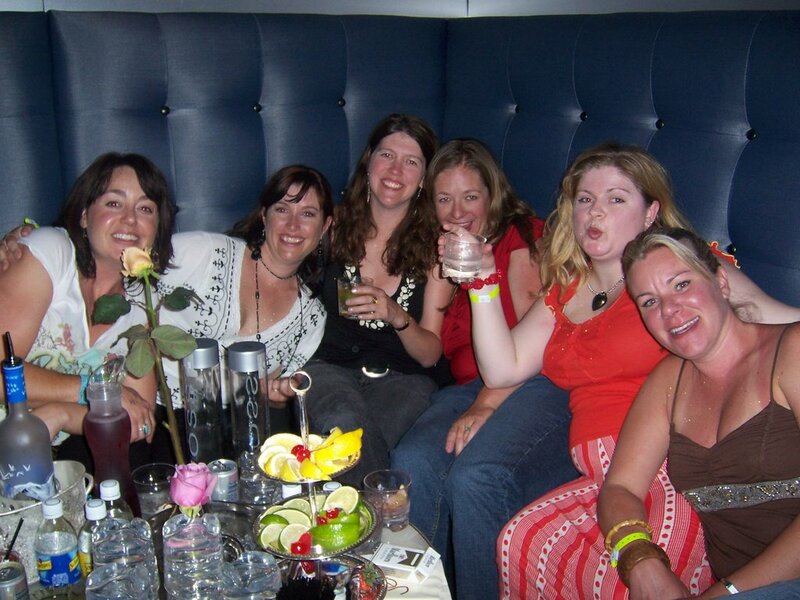 Yes, ten 30 something women out way too late and having too much fun. The party was for my best friend, Marian. Since Marian is such a fun, wonderful person all of her friends are the same way. The weekend had zero drama and tons of craziness. 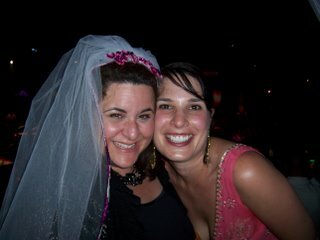 Me and Marian, the bride-to-be... but I'm the one wearing the veil! First of all, we all stayed together in a five-bedroom condo in South Lake Tahoe. We had a good view of the Lake but the best part was the heated pool on the beach! After staying up until 4:00 AM on Friday night we hung out by the pool the entire next day. 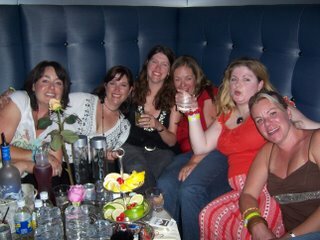 Saturday night we went to Vex this raging nightclub in Harrah’s. DJ AM (you know Nicole Richie’s ex) was there and he was incredible. Since I was the hostess for the weekend, I splurged and arranged for us to have a private cabana. This allowed us to go through the VIP line instead of waiting in the super long line! Once inside we had our own waitress and the service was awesome. We never had to wait in line for a drink because they bring the bar to your table. The waitress brought a bottle of Grey Goose and every conceivable mixer to the table. Also included was a wonderful tray of chocolate covered strawberries and other fruit. I really felt like a celebrity! The club was so much fun. We danced until 4:00 AM. (We danced so much that a few of us were sore the next day… and theday after that ;-) We went to bed after the sun came up. It was so much fun! One thing I noticed at the club is the fact that every woman was drop dead gorgeous and only about 1% of the guys were good looking. The ratio is way off. So, if you plan to visit S. Lake Tahoe anytime soon, I highly recommend Vex, but be sure to reserve your own booth or cabana. Oh how fun! I think you just made me want to get married, just for the bachelorette party. I've privatized my blog. E-mail me at wildcatkf@yahoo.com & I'll send you a new link with the password.